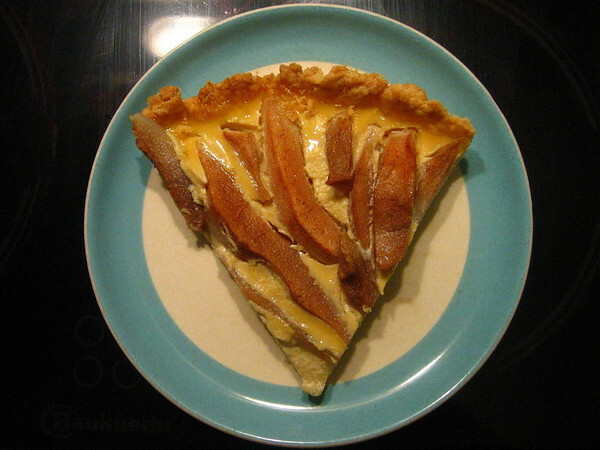 I made the pear tart again last weekend (picture above), and I promised I would share the recipe last time, but I never got around to it (I always see the round shaped wooden TUIT above my father’s desk when I say that). It is modified from a few of the Joy of Cooking’s recipes. Beat the eggs a bit then add the remaining ingredients (not the pears) and mix until blended. Slice three peeled pears into long slender slices. Take out the completed tart crust from the oven, discard the beans and parchment if you used them, turn down the oven to 325F. Make sure no cracks have developed in the crust, if so patch a bit with saved dough. Place the tart pan on a large piece of aluminum foil to catch drips from the custard. 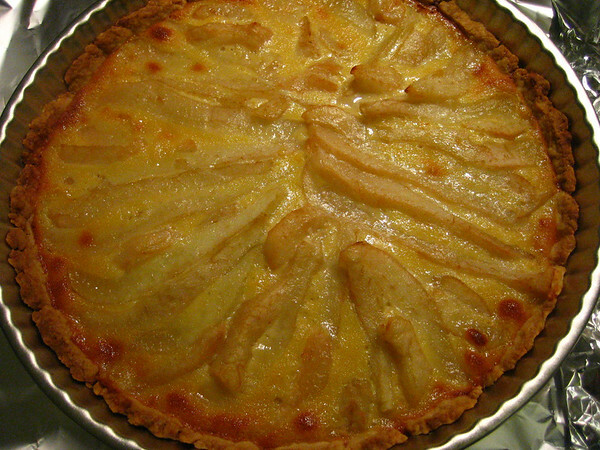 Arrange the pear slices on the tart crust and then gently pour the custard over the slices until just below the rim of the tart crust. Any leftover custard can be baked in the oven in a small ovenproof bowl. Bake the tart for 30 minutes in the 325F oven or until golden on the edges. Let the tart cool slightly before unmolding from the tart pan. Serve warm or cool. Pictured below: The first attempt of the tart holds the custard better if you don’t prick the crust too much. This entry was posted	on Tuesday, March 20th, 2007 at 12:00	and is filed under food. You can follow any responses to this entry through the RSS 2.0 feed. You can leave a response, or trackback from your own site.